Last March I decided to finally figure out the cause of my late night sinus headaches. I started a headache journal, ran numerous tests and tried several supplements. Nine months later and I still haven’t figured it out. The good news is that many of the things I suspected might be an issue were cleared. Also I have learned how to better respond to the pain, so even though my headaches haven’t decreased, my sleep quality is gradually improving. I’m not ready to give up and surrender to a doctor. Partially because I don’t trust them, but also because I still have a few more ideas to test. Before I list the new ideas, I will cover what I already tried and tested that didn’t reduce the frequency or intensity of my headaches. Seasonal Patterns – Headache frequency is the same throughout the year. Allergy Markers – Headaches have no correlation to pollen or allergen levels. Tyramine Restrictive Diet – Tyramine is often a problem with migraine suffers. Aromatherapy (ghetto) – I tried a cheap lavender fragrance dispenser. It did nothing. I might need to test an essential oil model. Dairy Free – I did a 30 Day Experiment without dairy. No difference. Nut Free – I also did a 30 Day Experiment without nuts. Chocolate Test – Could not detect any difference when removing chocolate. Neti Pot – For a long time I felt the Neti was reducing the intensity of my headaches (not the frequency), but recently I’ve been less of a believer. Daily Stress Levels – For 30 Days I tracked my stress level. I found no correlation to headaches. More water – Did nothing as well. Coffee Detox – This summer I dropped my coffee levels very low and then took 2 weeks off. It didn’t help, but I probably constructed this detox improperly. More on that later. Humidity – When I left Ohio, I thought I was onto something regarding the room humidity level. It turned out to be a false lead. I think a humidifier may reduce intensity on extremely dry nights, but it isn’t a cause of the headaches. Acupuncture – I did a few sessions of acupuncture, which did nothing to help. Here is a list of supplements that I have tried that did nothing for my headaches.Note that there are infinite possibilities to test when you consider dosage, length of test, timing and quality of the supplement. I did my best when testing these. None showed even the slightest benefit. Had one did something, I would have tested it further with different doses or timing. Neck Stiffness – For years I’ve had intermittent stiff neck issues. After reading the book 3 Minutes to a Pain Free Life, I became more aware of just how correlated they are with my headaches. On mornings when I had a headache, my neck was more stiff. Did the neck pain cause the headache or did my headache cause my neck to clench? Dr. Murray Grossan wrote: “Real sinus pain is actually rare, even when the patient is blowing yellow mucous out the nose. In many cases the “sinus headache” is really “referred” pain from the neck. Feel the back of your neck. Does the pain travel to the front of your forehead? This is because of the hookup of the nerves; painful stimuli radiates to the front area above the eyes.” Even if my neck issues are unrelated to my headaches, I am working on getting them resolved. So far the exercises in the 3 Minutes book have been ineffective for my neck. Histamine – A few months ago I went to a cider tasting. After only a few ounces, my face turned red and I had splitting headache for a day. At first I assumed the cider had gluten in it or that it was the alcohol itself. There was no gluten in it. The book Healing Your Sinuses mentioned a histamine link to sinus pain. So I tested drinking vodka and gin, like the book suggested, and I had no problems. Recently I began making water kefir and I noticed I was getting the same flush sinus headache. Even though the alcohol level was extremely low, the histamines were present. So what other foods contain high levels of histamine? Sadly, I learned fermented veggies have high levels. That might explain why it feels like I had more headaches in 2011 than 2010. But, histamine has a very short half life. So I don’t know if that could be the cause of something that wakes me up 5 hours into my sleep. Also, I haven’t noticed a response when eating kimchi or sauerkraut during the day. Liquid histamine sources clearly affect me, whereas solids I am uncertain. Maybe quantity and length of ferment also play a role? More testing is needed. Tannins – This is something I am just beginning to look into. Unfortunately, there isn’t a lot of information on this topic. 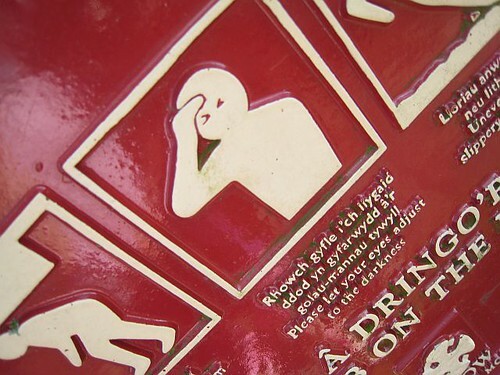 Some people are headache sensitive when they consume foods or drinks with tannins. What do I consume that has tannins? Tea, coffee and fermented foods. Yikes! One site mentions that the food addition carob bean gum is very high in tannins. I’ve never looked for it before, but apparently it is common. Mycotoxins – Frequent commenter GWhitney turned me on to a health podcast called Upgraded Self Radio. One of the topics that is frequently mentioned is the presence of mycotoxins in certain foods and our environment. Mycotoxins are molds that are present in many foods. Since I am mostly Paleo, I don’t get the ones from grains. However, I still consume hard cheese and cured meat. Mycotoxins are also present in coffees that are Dry processed, decaf coffees and robusta. This is a red flag for me. Over a year ago, I sourced a premium robusta bean for my espresso blends. My headaches did increase afterwards. But I don’t have great data going back that far. Also, I consumed decaf espresso during my detox. And the neighborhood coffee shop that I frequent the most switched to an espresso blend this summer that is all Dry processed. For 2012, I will avoid robusta, decaf and minimize my exposure to Dry Processed coffees. On the podcast, Dave advises ordering an Americano when the espresso is Dry Processed, as the steam used can kill the mycotoxins. Since I home roast coffee, I recently ordered nothing but wet processed coffee, with a heavy bias towards Single Origin Central American coffee, which tends to be the cleanest coffee one can consume. Caffeine – The coffee detox I did in 2011 was likely flawed. It probably wasn’t long enough and it didn’t address the caffeine I consumed in tea. My 2012 detox will be 100% caffeine free. No coffee, no decaf, no tea and no chocolate. It will be longer than 2 weeks. It will be miserable, but I need to know who I am in the complete absence of caffeine or caffeine withdrawal symptoms. Nightshades – Another class of foods that may cause headaches are nightshades. I consume very little white potatoes, eggplants or tomatoes. However, I do get my fair share of peppers in my kimchi. At some point in 2012, I will do a 30 Day Elimination test for nightshades. I’m going to continue working on my neck stiffness. I’m also going to cut way back on the fermented veggies. I’ve already started reducing my coffee and tea intake. When I do drink tea, I will favor green and lightly oxidized oolong, as they have less tannins that the darker teas. I stopped making water kefir and I’m going to be on the lookout for any food items containing carob bean gum. And sadly, I have stopped fermenting veggies for the time being. A long time ago, I read a book on trigger point therapy. I recall that, in the neck, the sternocleidomastoid muscle was associated with certain headaches. I’ve massaged that muscle specifically to attempt to “cure” a headache and it has helped a few times. The first time I did it, it seemed to work instantly. I wasn’t ever able to repeat that, and I don’t really get many headaches like those ones after 10 years of paleo. @Speno – Glad to know someone else thinks this idea has merit. Later today I am getting a massage. I’m also going to seek out new alignment exercises. MAS, I used to get absolutely terrible neck tension headaches in my early twenties. The one thing that helped loosen my neck (and relieve the headache) was peppermint essential oil. I applied a bit to the back of my neck. It leaves a burning sensation, but it worked really well. Craniosacral massage has helped me in the past as well. It targets the back of the skull. @Rachel – Interesting. I’m willing to give it a try. I located a place nearby that sells it for $5. I am interesting in trying Craniosacral massage. Have you found the results from a single craniosacral massage last? If you ultimately go to a doctor, I suggest Jonathan Wright, M.D. I am not sure if he still practices, but if he does my recollection is that he practiced in Kirkland, WA. @Alan – I take a magnesium mix every night called Ultra-Mag which includes a citrate. I didn’t include it in the list, because I did think it was related to headaches. I could experiment with increasing my dose. Thanks for the idea. How intense is the pain and when did it start? And at what times of the day? Is there a particular thought pattern that brings the onset of headache pain? On that note, have you tried acupuncture. I know some people swear by it. And even if it is just a placebo, who care’s? The pain is gone. @Thomas – Intensity varies. Starts usually 3AM or 4AM. I’m sleeping, so a conscious thought is not the trigger. I tried acupuncture. It didn’t work. I should have included it on the list. I’ll update the post. I’d second some of the ideas above -i.e. gettting some seriously good remedial massage for the neck and shoulder area. Just curious about alcohol. Do you consume it? Red wine, of course, can be very high in tannins. @GWhitney – I went almost 2 years without any alcohol. Then I did the cider test and determined it was histamines. Since then I have done 3 separate “1 shot” tests using gin, vodka and bourbon. I responded OK to all three with a slight edge to the gin. As for wine, I only use slight amounts on rare occasions for cooking. I was only taking 400mg of Ultra-Mag. Last night per Alan’s advice, I increased it to 600mg. Sounds like I got further to go. Today I’ll double that amount (in 2 separate doses) and then increase from there. Yesterday I got a great massage. Unfortunately, by the time I went to bed my neck was already locking up and ended up having 6 hour headache starting at 1:30 AM. Maybe it’s something physically happening while you sleep, like grinding your teeth or sleep apnea. Nighttime headaches are a very common symptom of sleep apnea. Try recording your sleep on video (with sound) for a couple nights and see if you notice anything. I think you would only be able to notice the more severe cases, so if that fails go see a sleep doctor/expert. You don’t have to trust them but they can track more variables than you may be able to do by yourself. @Ryan – That is a great idea. I just found an iPod app that measures for sleep apnea. Is it a good idea to have a cellphone near you when you sleep? @GWhitney – Fortunately for me, I actually got the iPod and not the iPhone. My cellphone is in a different room when I sleep. I always keep cellphones and other electronics out of my sleeping environment. Yes, living in Ohio can really mess a person up!! Something you might have already tried but didn’t see it listed is something that caused me problems for years…I was allergic to my furniture. After I moved to southwest Ohio, I started having terrible allergies and migraines. I never knew until after I bought some couch covers that the foam used in the couches caused some of my reactions. Once the couches were covered, my allergies and headaches were reduced a lot. I also found out that I grind my teeth in my sleep. My dentist fit me for an appliance (grind plate). That really helped …. especially my sensitive teeth. @OhioTom – If I only got the headaches when sleeping in my room, I’d think you were onto something. But I’ve been in different states with different furniture and still had the headaches. Thanks for the idea. Ha, there’s no such thing as “ghetto aromatherapy.” If it’s not essential oils, it’s not aromatherapy. I’m a snob about this, but also, there are supposed to be physical benefits aside from scent association. The chemical structure just is not the same when it’s a synthetic. And I have yet to smell a fake lavender I liked. The real stuff is worlds apart–and it’s not expensive, either. It’s low-priced for an essential oil (especially the NOW brand), and a little goes a very long way. Geranium is supposed to help with headaches too. I seem to get more into the non-classical migraines than the sinus headaches. I suspect that a diet too high in carbs, a diet with any significant amount of wheat, and a lack of sleep are all triggers for me. @Dana – Thanks for the comment. I will be getting the real aromatherapy setup this weekend. I hadn’t heard about Geranium. I’ll add it to my idea list. Wheat will trigger a headache for me, which is why I gave it up 2 years ago. Last month I got some accidental exposure and boy did I feel it. the above poster that mentioned you might be clenching could be on the right path. i used to get headaches all the time. i used to sleep with several pillows. once i eliminated all but 1 “contoured” pillow, they all but went away. i would suggest try sleeping without a pillow (if possible). if not, just the minimal amount of cushion you need. it will feel weird at first if you are used to a mountain of pillows. @Shane – I discovered the same thing. These days I often just use a towel for a pillow. I can not sleep with anything but the most narrow pillow. I’m not clenching my teeth. Hey Michael – Sorry to hear you’re having headaches. I’m sure you’ll find the root of it shortly. Do you use a chlorine shower filter? I’ve checked the water here and noticed a fairly high chlorine concentration recently. I also know several people in the area who have been having serious headaches recently and this could be the common denominator, especially if the city has increased the chlorine recently. Good luck! @John – That is something I was unaware of. I’m adding it to the list of ideas. Thanks! I have had these type of headaches off and on for most of my adult life. Mine are related to neck tension. It’s just where I carry a lot of tension. I am not particularly stressed when I get them. It is a habit to carry stress in a certain way in your body, a postural issue. I have to get out of bed and get upright when I wake up with one, or it doesn’t get better. If this is your experience, I would recommend that you get a set of really good neck stretches that work for you and do them daily, especially before bed. Work on relieving that tension and breaking that habit. I notice them more when I have worked out or when I have stayed at the computer a long time without a break. Massages will help if that’s what it is, but you can help yourself more by stretching daily. When they interfere with my sleep for several days, I break down and take 2mg. of Valium at bedtime, which is, by the way, the cheapest, best, and safest chemical muscle relaxant. The headaches are gone for a long time after that. Good luck, and I hope you find something that works for you! It’s miserable! Your keeping track of everything sounds like the past 6 years of my life and counting. I have all these strange health issues including a few different types of headaches and I took have found some of the causes of those. The night headaches could be pushing your head back/side into the pillow, biting down, or even pushing your own hand into your head (I’ve woken up doing all of these and more, super active sleeper sometimes), neck strain is certainly one too…bob your head back and forth a “yes” and a “no” while your head is hanging down (spread your legs wide it’s easier to get the head down low), gently a few times, it really loosens up the neck (it’s a yoga trick to release/check your holding tension). I’ve got severe acne rosacea pyoderma faciale that goes from bad to worse and after I eat certain foods…I was on a restricted diet for 4 months I literally ate only 6 foods, pure hemp protein (nutiva, plain) needed fiber, cooked pears, sweet potato and chicken oh, and blueberries. NOTHING else, I kid you not. I was determined to figure out all my health stuff…did an MRT test which said those 4 foods were the only ones I could eat…my face didn’t clear up at all…now I see some of those foods were high histamine foods…I think I’m going to do that one next…This is so fun huh? Best of luck to you…I agree about the doctors comment…actually, I started doing Ayurveda dinacharya (routine) two years ago and have healed most all of the other health issues I had, including some neurological tremors etc., and gut stuff all sorts of neat fun things;) well again, good luck!! and to anyone else out there…KEEP trying!! Don’t give up!! @Michelle – Thanks. My histamine test has begun and I can see it is at least a minor player in my headaches. Maybe more. More testing continues. I get migraines that started in my 40s and got progressively worse over a 5 year period. I can personally testify I decaffeinated (still drink decaf coffee, but didn’t for the first several weeks), and the first week was painful, not only with headache, but with body aches. Sleep patterns were interrupted, and I wasn’t a huge caffeine person to begin with. It took three months before the migraines were under control, and they remain so, luckily. And yes, I also have neck pain I thought was related. Turns out I still have neck pain, but fewer and remarkably less intense headaches. Closing out comments on this post.